Is it time for a bathroom update? Read on for five questions you should ask yourself first to make the smartest remodeling decisions. 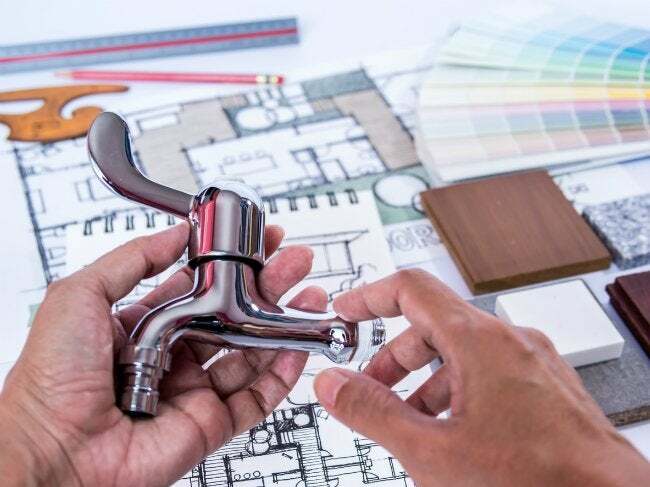 While updating a bathroom ranks at the top of many a homeowner’s wish list, complete renovations can be pricey—to the tune of $18,000 or more, depending on the bathroom size and choice of fixtures. To get the most for your remodeling dollar, analyze your needs and wants first to make informed decisions. These five key questions can help homeowners ward off renovation regret—or, worse, do-overs. Want to get it right the first time around? Keep reading to find out what you should consider before leaping into your bathroom project. Above all else, take safety into account when selecting a new floor for your bathroom. Sometimes, safety means ignoring the inspirational images shared in high-end home magazines, which often showcase impractical marble floors. “Stepping out of a tub with wet feet onto a polished marble floor is a recipe for disaster,” Maykut says. His suggestion? Slip-resistant ceramic tile. Look for ones that showcase a coefficient of friction (COF) rating right on the box, which indicates that the tile is safer to walk on when it’s wet than other types of tile. Homeowners often don’t factor traction differences between tiles into their renovation plans, but support from Sears Home Services means that this important detail will never be overlooked. In a bathroom design process with Sears, their knowledgeable professionals help narrow down design choices to the most appropriate possibilities. Likewise, real wood and laminate flooring are unsuitable for the bathroom because they can eventually warp or delaminate from exposure to water. “If consumers don’t want ceramic tile, they still have plenty of designs to choose from in vinyl flooring,” Maykut offers. Today’s vinyl flooring has come a long way, and it can closely mimic the look of real wood, brick, slate, or stone, but it’s much more affordable. How can I create enough storage? Most bathrooms have less square footage than other rooms in the house, yet they have to store plenty of essentials, from shampoo to toilet cleaner, and from mouthwash to guest towels. While there may not be enough space in a bathroom to accommodate a full linen closet, you can increase storage by thinking creatively. Opt for an enclosed vanity instead of a pedestal sink to provide under-sink storage for less-than-pretty cleaners and scrub brushes. Plan to install plenty of towel bars or hooks, and use stackable bins in cabinets. An upper cabinet above the toilet is also a great way to put unused space to work. 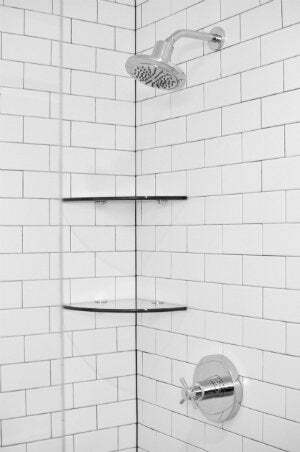 Before you build in a bunch of storage solutions, think about what to put where—and prioritize making everyday-use items like bathing products accessible where you need them most. Maykut suggests choosing showers that are outfitted with little niches “to keep from having to put shampoo and conditioner bottles in a caddy on the shower floor, where they’re hard to reach and pose a tripping hazard.” The same goes for bathtubs: A wide, flat rim around the tub that can securely hold body wash, soap, or washcloths will go a long way toward creating a better bathing experience. Do I need a shower or just a tub? “If a homeowner has the luxury of having more than one bathroom in the house, it’s a good idea to install a walk-in shower in at least one of them,” Maykut advises. Already have a shower elsewhere in the house? Then just a tub is probably fine in the current renovation. Otherwise, you should include a walk-in shower, if only as an investment in the future. 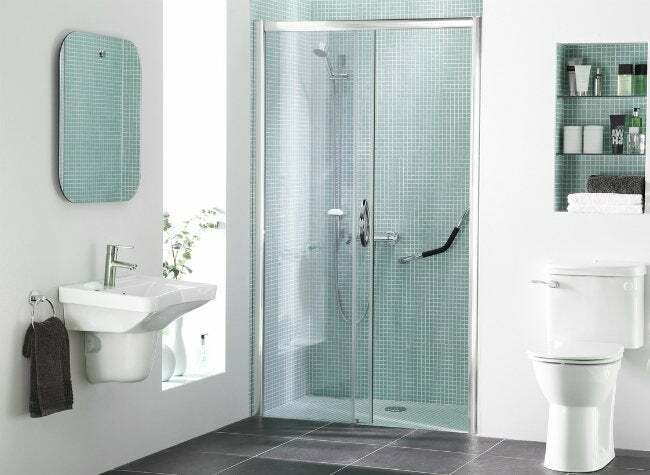 “Accidents can happen that make it challenging getting in and out of a tub.” With either age or reduced mobility, stepping in and out over the wall of a slick, wet tub becomes a safety issue; shower stalls provide less opportunity to slip and fall and can offer space for a bench, if necessary. Bathrooms are notoriously humid. Just as long, hot showers leave mirrors steamed up, that same moisture also coats the walls and woodwork—even if you don’t see it. The damp environment can become a breeding ground for mold and mildew, unless you take measures to dry out the space. A good fan effectively removes steam from the bathroom and vents it outside of the house. Better yet, today’s bathroom vent fans work much more quietly than their predecessors, scarcely making more than a faint hum. Whether you opt for a plain vent fan, fan/light combo, or a model with a built-in heater (perfect for warming the bathroom during chilly winter months), consider this installation a must-do. What should I look for in new bathroom fixtures? Homeowners have a wealth of options to choose from when redesigning the bathroom, including fixtures that offer a combination of great design, comfort, and high efficiency. However, fixture costs add up quickly, with fancy amenities like heated toilet seats and high-end showers equipped with multiple shower heads. Putting the biggest emphasis on efficient features can help you recoup costs in your monthly utility bills while also benefiting the planet. Next, consider comfort. Comfort-height toilets are the new kids on the block, and for many consumers they’re a welcome change from standard toilets with low 15-inch-high rims. The higher, 17-inch to 19-inch-high rims make getting on and off the toilet more comfortable for most adults, especially the elderly and the disabled. Even after narrowing your search to fixtures with features that meet your biggest needs, you won’t feel limited on style. Sears Home Services makes it easy for homeowners to plan an entire renovation from the comfort of their own home. “It’s like bringing a bathroom showroom right to your door,” Maykut says. Once the design and fixtures are selected, Sears Home Services handles everything from ordering fixtures to scheduling reputable contractors. “It’s the best way to guarantee that customers get a bathroom they’ll be happy with for a long time,” he says.